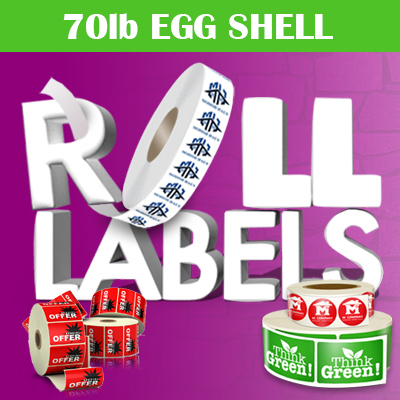 Roll Labels Printed in Full Color on 70lb Egg Shell Adhesive Stock. Printed on 70lb Egg Shell Adhesive Stock. Available with a Egg Shell Felt Finish only. Condensation Proof. Perfect for refrigerated product labels. Contains 30% post consumer recycled compost. Roll Labels have a 3" core and an outer diameter of up to 6". When you’re looking for a label stock with a distinctive texture and added eco-friendliness 70# Eggshell Felt is your choice. This stock choice holds ink wonderfully and contains 30% post-consumer waste. It is water resistant and adheres easily to a variety of surfaces. We recommend it for indoor use only. Have a question about our roll labels or need help with set up? You can find many common questions answered on our Roll Label FAQ Page. Select Circle, Oval, or Square or Rectangle Shape. Select an Unwind option. Unwind from Top, Unwind from Bottom, Unwind from Left, or Unwind from Right.